bankers take priority over taxpayers. The only one to speak up for the Irish was UK chancellor George Osborne, but Geithner, as always, got his way. An instructive, if painful, lesson in the extent of US soft power, and in who our friends really are. ….Given the political paralysis in the EU, and a European Central Bank that sees its main task as placating the editors of German tabloids, the most likely outcome of the European debt crisis is that, after two years or so to allow French and German banks to build up loss reserves, the insolvent economies will be forced into some sort of bankruptcy. ….Make no mistake: while government defaults are almost the normal state of affairs in places like Greece and Argentina, for a country like Ireland that trades on its reputation as a safe place to do business, a bankruptcy would be catastrophic….Worse still, a bankruptcy can do nothing to repair Ireland’s finances. ….National survival requires that Ireland walk away from the bailout. This in turn requires the Government to do two things: disengage from the banks, and bring its budget into balance immediately. First the banks….The original bailout plan was that the loan portfolios of Irish banks would be sold off to repay these borrowings. However, foreign banks know that many of these loans, mortgages especially, will eventually default, and were not interested. 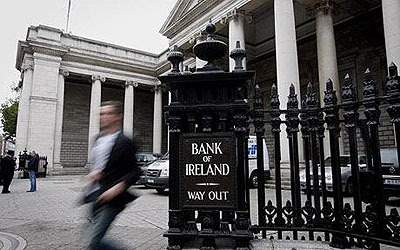 As a result, the ECB finds itself with the Irish banks wedged uncomfortably far up its fundament, and no way of dislodging them. This allows Ireland to walk away from the banking system by returning the Nama1 assets to the banks, and withdrawing its promissory notes in the banks. The ECB can then learn the basic economic truth that if you lend €160 billion to insolvent banks backed by an insolvent state, you are no longer a creditor: you are the owner. At some stage the ECB can take out an eraser and, where “Emergency Loan” is written in the accounts of Irish banks, write “Capital” instead. When it chooses to do so is its problem, not ours. I suppose this analogy is wrong in a hundred different ways, but I can’t help thinking that this is a lot like the aftermath of World War I, except in reverse. This time it’s Germany acting as the imperious victor, demanding that the citizens of Ireland (and Greece and Portugal) immiserate themselves for years to pay back loans that they will never be able to pay back. It’s easy to see why this is happening — thrifty Germans rather predictably don’t feel like they should have to bail out spendthrift euro countries on the periphery — but it’s also easy to see that there’s no way it can end well.2 Likewise, it’s easy to see why Geithner and others don’t want to force still-fragile French and German banks to eat huge losses that could destabilize the global banking system in hard-to-predict ways. But again, it’s also easy to see that there’s really no choice. One way or another, neither Ireland nor Greece will ever be able to make good on their debts, and that means that either creditors or taxpayers in the rest of Europe — or both — are going to take a bath. Would it be better to take that bath now, or better to wait a couple of years for the economy to recover before doing what has to be done? I don’t know. But if I had to guess, I’d say that another two or three years of uncertainty (at best) or disaster (at worst) isn’t worth the risk. Like it or not, Europe’s banks and its taxpayers are probably better off dealing with this problem now. And it’s not as if Ireland or Greece would be getting off without any pain, after all. Part 2 of Morgan’s plan is to bring the Irish budget into balance, which would cause even more wrenching austerity than they’re going through now. There’s plenty of pain to go around. 1NAMA is a “bad bank” set up a couple of years ago to hold the worst toxic waste of the Irish banking system. 2Edited to make clear that I’m not especially defending the German attitude, just noting that it’s perfectly understandable.